The BJP is almost certain to support the Kuldeep Bishnoi’s HJC in the Hisar Lok Sabha byelection.According to informed sources, a formal announcement is expected within a week. INLD supremo Om Prakash Chautala has declared that his party will go alone in the Hisar Lok Sabha byelection. The main election issues would be corruption, land acquisition policy and rising prices. Despite a grave security risk to the lives of common people due to increasing acts of terrorism, the authorities concerned appear to be following their old style of functioning. On an order issued by the Punjab and Haryana High Court, the district police today arrested sub-inspector Pratap Sharma along with a woman, Kamala Kashyap, alias Shalu, on charges of running a blackmailing racket in the city in which businessmen were forced to shell out hefty amounts of money after false cases of sexual harassment were filed against them. The medium-intensity earthquake that jolted the national capital region (NCR) on Wednesday night has sent the scientists in a tizzy. They are undertaking a detailed exploration to find out as to what triggered the tremors underneath the Sonepat-Kundli border, which was the epicentre of the earthquake. The impasse over the cremation of a Gorakhpur farmer, Ishwar Singh Siwach, who died on Tuesday, could not be resolved even after renewed efforts by the authorities. The Haryana Sikh Forum has unanimously resolved to vote only for Amritdhari Sikhs with a “clean image”, who do not use intoxicants. The forum appealed to the Sikhs to ensure that only “true Amritdhari Sikhs” were elected to the SGPC. Gurgaon Deputy Commissioner PC Meena, who is also the chief administrator of Sri Mata Sheetala Devi Shrine Board, Gurgaon, dismissed one and suspended five employees of the temple today. The CBI today produced four accused before Judicial Magistrate First Class Jaiveer Singh for further remand. The CBI had demanded 14-day remand for the accused but the court sent three accused Pradeep Thakur, Satinder Malik and Raj Kumar to six-day police remand and Ram Kumar to 14-day judicial custody. Happy Singh (21), a BA final-year student of the local CRA College and a resident of Thana Khurd village, was today brutally stabbed to death in a local park allegedly by a group of students of the same college. It is learnt that the two parties are negotiating a long-term relationship, which will extend to the next Lok Sabha elections as well as the Assembly elections due in 2014. One formula being discussed is that while both would contest 45 seats each in the 90-member Assembly , the BJP would contest eight of the 10 Lok Sabha seats in Haryana and the HJC two . The two seats likely to be left for the HJC will be Hisar and Bhiwani. Sources say the state BJP was keen to contest the elections on its own. The argument was that if the HJC were to be eliminated from the political scene of Haryana, the BJP could become a major platform for non-Jat voters. However, the BJP high command told the state unit to choose between the INLD and the HJC. This tilted the opinion in favour of Bishnoi because many Haryana BJP leaders had suffered at the hands of the Chautala when he was in power. Sources say Bishnoi has met most senior BJP leaders, including LK Advani, party president Nitin Gadkari, Sushma Swaraj and Arun Jaitley to persuade them to support his party in the Hisar byelection, which is a battle of political survival for Bishnoi. Meanwhile, the INLD has decided to organise a big rally on September 25 in Hisar to celebrate the birth anniversary of former Deputy Prime Minister Devi Lal. The blast at the Delhi High Court on Wednesday may have made the police department to step up vigil, but none of the important public places in the city has come under the CCTV surveillance so far. “In spite of the tag of the Chief Minister’s city, it has hardly made any positive impact when it comes to maintaining public safety and security,” claimed a retired government official on condition of anonymity. “The authorities may be claiming to go hi-tech with their plan to arm the cops with laptops, a reality check on the ground level points towards gaping loopholes in the security network especially at some of the important and vulnerable public places. Several metal detectors in the city remain non-functional at any time,” said police sources. 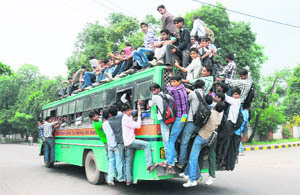 “The district court complex, the bus stand, the railway station, the PGIMS, the university campus and the markets, including the Quilla road, Palika Bazar, the Shourie Cloth Market, Bhiwani Stand and D-park (Model Town) are some of the spots which see a huge rush at any point of time and these call for the attention of the police and security personnel, but not a single CCTV has been installed so far,” said Yoginder Dahiya, a lawyer based here. However, the SSP, Satish Balan, claimed that the plan to install CCTVs at important points was in the pipeline. Faridabad: A silver-coloured Santro car, suspected to be used by terrorists involved in yesterday’s bomb blast outside the Delhi High Court, was found abandoned here today at a deserted place in Sector 56. The car (DL 9C A6034) was spotted by the local police. Subsequently, the Delhi Police was informed about it. According to the acting in charge of the police station, Sector 55, Nand Kishore, a team of Delhi Police personnel took away the car this afternoon. Although police officials are not willing to put it on record, there are doubts in the police circles about any relation of the car to the Delhi High Court blast. The car was also suspected to have been used by some criminals in an unrelated crime at the Delhi airport. However, the jury was still out on whether the car was in any way related to yesterday’s blast. The matter had came to light after IG, Rohtak range, V Kamaraj, had asked DSP Virender Vij to look into a complaint by Pratap Singh, a local industrialist, in which he had accused Pratap Sharma, in charge of the Sector 29 police post, of extorting money from him. According to the complaint, Singh alleged that on March 19, Sunita Sharma called him on his phone and said that two women had got a case of sexual harassment registered against him. Singh said the woman also told him that she could save him from legal action if he paid her Rs 5 lakh. He said when he approached the in charge of the Sector 29 police post, Pratap Sharma, the latter stated that a complaint had been received and suggested that an out-of-court settlement would be better. Fearing social stigma, Singh asked one of his friends to get in touch with Sunita. The friend managed to strike a deal with Sunita for Rs 1.5 lakh. Singh alleged that money was paid to the two women at the police post and when he asked for a copy of the settlement, the SI asked him to pay him Rs 1.5 lakh for foregoing legal action against him. In his inquiry, the DSP found substance in the complaint filed by Singh and on the basis of the facts collected by him, he ordered registration of a criminal case against sub-inspector Pratap Singh along with four women, Sunita Sharma, Shalu, Sania and Saroj. However, no arrests were made in the case and after the matter was taken up in the high court, the court issued an order on August 29 asking the district police to arrest the accused and produce them in the court before September 27, which was fixed as the next date of hearing. According to JL Gautam, director, operations, at the Earthquake Operational Centre at the India Meteorological Department (IMD), New Delhi, Sonepat has been lying over a minor fault zone where the centre has registered low- intensity seismic activity from time to time. According to the experts, the earthquake measuring 4.2 on the Richter scale, which lasted for less than five seconds, could have turned into a major disaster if it had lasted for a longer duration. Gautam maintained that Sonepat was in an active region and despite keeping a round- the-clock vigil at the seismic activities in the region, it was not possible to predict when the earth would suffer a shudder next. Though, it is widely believed that the intra-plate movement, which was witnessed at Sonepat, could not result in a major earthquake, the director refused to rule out the possibility of a massive tremble in the region. He said the department had been maintaining a 16-station V-SAT based digital seismic telemetry system around the National Capital Territory (NCT) of Delhi for close monitoring of seismic activity in the region. . Meanwhile, Sonepat Deputy Commissioner Pankaj Aggarwal said that following the earthquake, the administration had put the disaster management team on alert. The tremors were even felt in Panipat, Faridabad and Gurgaon among other towns of Haryana besides Noida. A deputation of farmers, who met the authorities on an invitation of Ashok Meena, ADC, said in no uncertain terms that the farmer’s body would not be cremated till the government released their land from acquisition for the proposed nuclear power plant and accorded the status of a martyr to Ishwar Singh. Earlier, Meena went to the dharna site and invited the striking farmers for negotiation over their demands with the authorities. Later, a deputation of farmers comprising Hans Raj Siwach, president of the Kisan Sangharsh Samiti, Lakhwinder Singh, son of the deceased farmer, Dana Ram, Satyawan and Binder met Vijay Singh Dahiya, DC, in presence of Meena. Dahiya told the farmers that since both demands were beyond his authority, he would convey their demands to the government. The farmers came back rejecting Dahiya’s appeal, who quoted social traditions for timely cremation. Meanwhile, the agitation by the farmers received a shot in the arm, when the members of the District Bar Association offered their support to their stir. Over 50 lawyers from the district courts led by Advocate Upender Gera, president of the District Bar Association, went to the dharna site and offered their support to the farmers. “We have passed a resolution supporting the farmers’ demand for release of their land and also shifting of nuclear power plant from Gorakhpur,” Gera said. Farmers from several other surrounding villages of Gorakhpur have also come in support of the striking farmers. Supporting the demand for a separate Sikh Gurdwara Committee for Haryana, the forum said after the reorganisation of Punjab in 1966, a separate SGPC was a natural consequence but it did not happen as Haryana Sikhs could not generate support. “ Haryana Sikhs desire that the funds generated by gurdwaras in Haryana are utilised for the welfare of Haryana,” a resolution said. Opposing the acquisition of agricultural land, the forum said farm holdings were squeezing and in case the government continued to acquire land and then sell it to builders, the farming community would eventually be eliminated. The government should acquire only uncultivated land for public projects and that too at the market rate, a resolution insisted. The action was taken after a devotee from Delhi complained that a bundle of currency notes offered by him at the temple was whisked away by an employee. KK Gupta, CEO of the board, apprised the DC of the matter, who ordered an inquiry into the matter. The “theft” of offerings was established with the help of a CCTV camera installed at the temple. The footage showed a peon taking away the bundle of notes. On being interrogated, the peon admitted to lifting the bundle of notes, but maintained that she had handed over the bundle to another peon for putting it into the donation box. However, the putting of the bundle in the donation box could not be proved. Malik had fired a threatening gunshot, which had almost hit Tejas Gaba’s mother Neena Gaba’s feet to stop her from foiling the kidnapping. This was confessed by four accused before the CBI. Sources said the accused had used fake driving licences for verification at various cyber cafes to send emails to demand ransom from the Gaba family. Moreover, the Accord car, which was used for the kidnapping, was also stolen from UP. According to sources, Pradeep Thakur was the gang leader whereas Satinder Malik, Ram Kumar and Raj Kumar worked for him. According to information, there was an altercation between two groups of students yesterday. Happy Singh was attacked today when he was going to the college after getting down from a bus at Subhash Chowk. On a complaint of the victim’s father, Jagbir Singh, a case of murder has been registered against Mehtab, of Gumar village, Anshum, of Khewra village, and five others who escaped after committing the crime.